If you’re choosing an affordable phone, you want something with all the basics: a little style, enough processing power to play your favorite casual games, a capable camera, and battery life that can get you through the day. 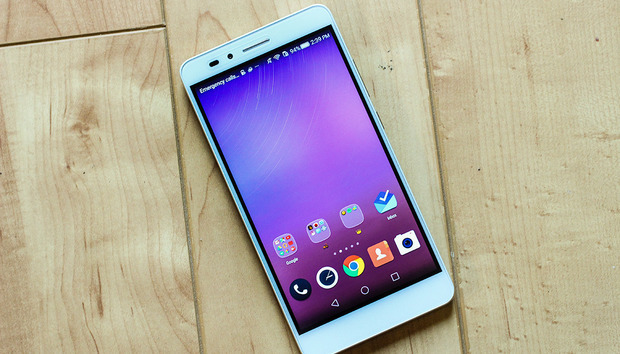 The Honor 5X offers all of these things for a measly $199. That’s a hell of a deal, but it comes with a few compromises. What’s more: Honor is supposed to be Huawei’s cooler, hipper brand that’s meant for a younger crowd, but it might take more than what the 5X is offering to turn those millennials into repeat customers. The back is all brushed aluminum metal. When I think of the Honor brand and how it relates to Huawei, I think of the difference between buying a knockoff dress at H&M and purchasing the real thing at Bloomingdale’s. The quality garment from the department store certainly looks and feels the best overall, but its exorbitant price point is not usually worth the splurge. And no one will really be able to tell how much you spent on your clothes, anyway. The rear-facing camera lens pops out a bit. It’s light, but not flimsy. Hey Millennial: does this look like a phone that would sit on your table? That’s how I feel about the Honor 5X. It’s a relatively attractive device, and though it doesn’t feel as preened and polished as HTC’s One A9, for example, it has all the finishing of a high-end device: a brushed aluminum backside, pearl white trim around the edges (it’s available in black and gold, too), and a ridged power button and volume rocker on the left-hand side. It also offers dual SIM slots—one nanoSIM and one MicroSIM—and a MicroSD expansion slot, so you can store your music, movies, and photos without worrying too much about taking up space. What’s more worth it: NFC or a rear fingerprint scanner? There’s also a rear-facing fingerprint sensor that’s just as quick as the Nexus 6P’s, which you won’t typically find on phones in this price range. However, the 5X is missing a few other smartphone staples, like NFC and wireless charging. You shouldn’t expect to have it all for $200, but I feel like millennials will want to at least unlock a phone with their fingers and use it to pay for things. The Honor 5X has a pretty capable 1080p screen. But you can tell it’s just a little on the cheap side. The Honor 5X’s 5.5-inch 1080 IPS screen is also where you start to see the difference in build quality compared to a more costly device. There’s nothing inherently wrong with the 5X’s display, but its viewing angles are not as clear as a phone that costs three times as much. I also noticed a ghosting effect when I glanced at it from the side. You don’t expect stellar performance from a phone this cheap, but the Honor 5X’s 1.5GHz Snapdragon 615 processor is good enough. Loading applications and games was typically a cakewalk, though I did deal with the occasional sluggish interface. I was pleased to see that the 5X could also handle some of the heavier millennial-geared applications like Ditty, a silly little app that lets you make your own music videos, and Rayman Adventures. My only issue while using the 5X is that it gets scalding after you’ve had the screen on for a while. Ow. In tests like PCMark, which gauges a phones performance while browsing the web or editing photos, the Honor 5X performed on par with others in its class, like the Moto G.
In 3DMark, the Honor 5X was less successful, and even trailed behind devices like the OnePlus X. Our benchmark tests told a slightly different tale. The Honor 5X scored well with apps that test general smartphone performance, like PCMark, but seemed to suffer when more processor-intensive applications came to play, like its graphics-measuring counterpart, 3DMark. It also constantly fell behind similarly-stacked devices, like the One A9, and even the OnePlus X, with its generation-old processor, managed to outrun it. The Honor 5X’s 3000 mAh battery pack outlasted most of the competitors in its class, including the OnePlus X and Moto G.
There’s nothing worse for a young millennial than when their primary medium of keeping in touch with friends is out of order. That’s probably not going to be much of an issue with the Honor 5X, though, because it boasts some pretty impressive battery life. Its 3,000mAh battery lasted 7 hours and 28 minutes in the PCMark battery rundown test, and 4 hours and 40 minutes in GeekBench’s. Overnight, it only used up about 10 percent of its juice, and even then it’ll pop up with an alert to tell you of any apps that are running rampant in the background. Since the 5X isn’t exactly a powerhouse, it’s not constantly burning through a ton of energy, and that will bode well for both kids and adults who just can’t seem to put the phone away. The Honor 5X’s camera interface is a cinch to use. The veggie po’ boy looks pretty dang tasty with the Good Food mode turned on. The Honor 5X’s camera app interface is a cinch to figure out and it offers quite a few features, including a Time Lapse mode, Panorama, HDR, Watermark, and slow motion capture. There’s even a setting to control the audio in video mode. However, I do think Huawei is trying too hard with cutesy modes like “Good food.” Just call it Macro mode. A few test shots taken with the Honor 5X. The Honor 5X is equipped with a 13-megapixel rear-facing Sony IMX214 camera sensor. It does not offer optical image stabilization, so most photos come out a tiny bit blurry if you’re not perfectly still. It also offers a f/2.0 aperture and works okay in darker environments. Its low-light performance is about on par with the OnePlus X, which has similar specs. My favorite part of the 5X is that there’s an option to leave the flash on and take a photo with the subject all lighted up. There’s also a feature that lets you take the “perfect selfie,” which works wonders and makes me wish I was five years younger. We need to talk about the “other” versions of Android. In Huawei’s case, the EMUI 3.0 built on top of Android 5.1.1 is both difficult to pronounce and confusing to use. I don’t deny that it’s more attractive than both Samsung and LG’s versions of Android, but it doesn’t offer an application drawer, and that’s a glaring omission in my book. Look, Ma! No drawer! Just lots and lots of folders. Any application you download will end up living on the Home screen, which is just awful. I left iOS precisely because I didn’t want to deal with a bunch of seldom-used applications clogging up the screen. You can regain access to that drawer by downloading the Google Now Launcher, but by default you’re stuck putting icons into carefully-labelled folders. I do appreciate that EMUI allows me to set which apps can run after the screen is turned off, which can help save both data and battery life in the long run. EMUI does have some redeeming qualities for new Android users, though. It’s not on Marshmallow yet, so you won’t have access to features like fine control over app permissions, but you can select which applications can run in the background when the screen is off. EMUI will also tell you if an application is running rampant with your data, which is good to know if you’re not typically hanging out on Wi-Fi. Also, it’s not packed with bloatware, and I was pleased to see that scary applications like like Clean Master don’t come bundled with it. The Notifications shade isn’t so bad, either, but I do wish that it wasn’t so cluttered where there’s a bunch nofitications to clear. To recap: I don’t think the Honor 5X is held down by its Android interface, but you might be inspired to do some customization before using the phone as your daily driver. And that’s the beauty of being an Android user: if you don’t like what you see, you can always try something else on for size. What do you think, Millennials? Is this your next phone? I can see what Huawei’s attempting here. The Honor brand is meant as a starter pack of sorts for the new generation of the technology-minded. If you aren’t already hooked on Apple or some other Android-focused brand, Huawei’s hoping to reel you in with the price. Then, when you’re ready to upgrade to better hardware, Huawei hopes you’ll choose one of its feature-packed marquee devices as your daily driver—assuming, of course, that Huawei manages to strike it gold in the U.S. market by then. I’m not so sure that strategy is going to work without the support of carrier marketing, though I do like the idea of a $199 unlocked device that I can buy as a burner phone, or as a starter device for a younger smartphone user. The only drawback is that it doesn’t work on all major carriers, so you can only really consider the 5X if you’re already on AT&T or T-Mobile.